The long-awaited first Zelda game for the GameCube is called The Wind Waker. As you certainly already know, the "cel-shading" method was used to give a "cartoonish" look to the graphics. Your messages on the forums prove it, you either like it or you don't! 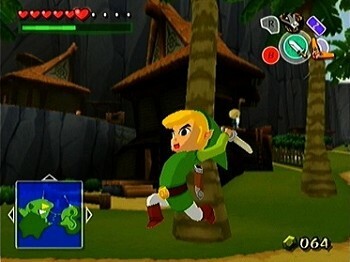 The game title comes from Link's ability to control the direction of the wind by playing music with a conducting baton. This ability shows up whenever he travels on his boat. This adventure came out in May 2003 in Europe and in March 2003 in North America. It begins a few hundred years after Ocarina of Time (and so after Majora's Mask as well). By knowing this, we can logically assume it's once again a brand new Link. In this game, our young hero lives on a small island until, on the day of his 12th birthday, he sees a giant bird kidnapping a young girl. Aryll, Link's sister, asks him to go save the girl but as he finds her, the bird snatches Aryll. Link must then travel across the country to get his sister back. Note as well that by linking the Gameboy Advance (without any game in its slot) to the Gamecube, Tingle will appear on the handled console and will play a radar role, indicating the secret places. Long ago, there existed a kingdom where a golden power lay hidden. One day, a man of great evil found this power and took it for himself, and with it at his command, he spread darkness across the kingdom. But then... just as all hope had died, a young boy clothed in green appeared as if from nowhere. Wielding a blade that repelled evil, he sealed the dark one away and gave the land light. This boy, who traveled through time to save the land, was known as the Hero of Time. The boy's tale was passed down through generations until it became legend. What became of that kingdom...? None remain who know. The memory of the kingdom vanished, but its legend survived on the wind's breath.